In a large saucepan combine sugar, cornstarch, and cocoa powder. Add half and half or milk. Cook and slowly stir over medium heat until thickened and bubbly. Cook and stir 2 minutes more. Remove from heat and stir in butter, vanilla and salt (optional). Stir in chocolate until melted. Ladle into serving bowls. Cover surface with plastic wrap to avoid crusting on top (see the picture); chill up to 24 hours. You may serve with whipped cream on top or sprinkle with additional cocoa powder. Orta boy bir tencerede seker, nisata ve kakaoyu karistirin. Krema ya da sutu ilave edin ve guzelce karistirin. Orta ateste yavasca karistirarak koyulasana ve kaynayana dek pisirin. Baloncuklar cikmaya baslayinca karistirmaya devam ederek 2 dakika kadar daha pisirin. Atesten alin, tuz, vanilya ve tereyagini ilave edip karistirin. Sonra, parcalanmis cikolatalari ilave edin ve eriyene dek karistirin. Servis kaselerine doldurun, kabuki olusumunu engellemek icin uzerine hava gecirmeyecek sekilde plastik film ile kapatin (resime bakiniz). Yaklasik 24 saat boyunca buzdolabinda saklayin. 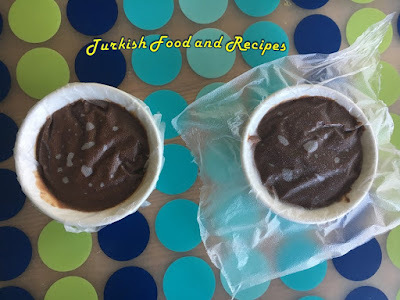 Uzerine krem santi ya da kakao koyarak servis yapabilirsiniz. 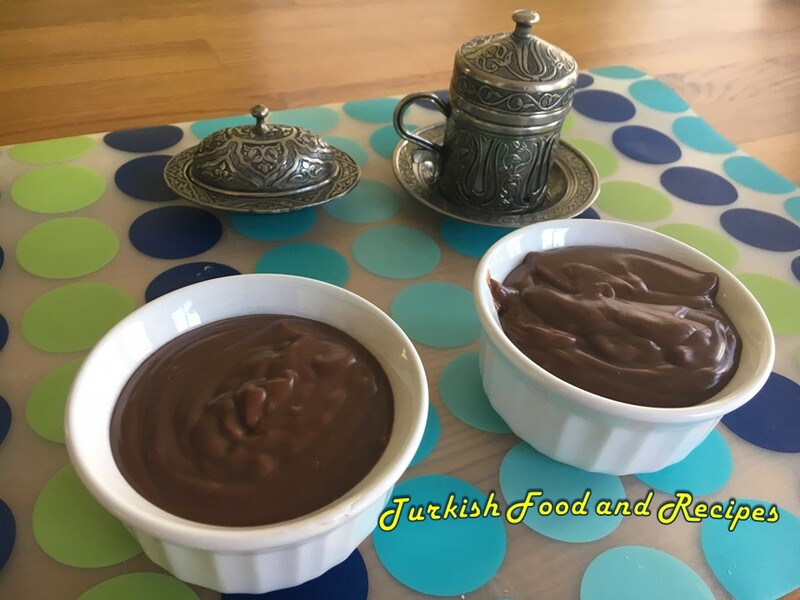 The recipe for this pudding is suitable for all moms whose children are very fond of chocolate, because it is useful and tasty. I really enjoy cooking and eating chocolate pudding so I'm always happy with the new recipe for this dish. The ingredients of the dessert is very fresh and tasty. So, I am sure that this pie will be very rich and delicious. Fare well. I admire you talent to say this inspiring words to audience. Thank you for this. Good for you.